I am pleased to meet you on the occasion of the 50th anniversary of the foundation of the Italian Association against Leukemia-Lymphomas and Myeloma (AIL). I greet you all with affection; in particular I greet the sick here gathered, with a special thought for those who could not be present. I thank your President, Professor Sergio Amadori, for his words, as well as doctors, health workers, those involved in research, volunteers and those who share the aims of your praiseworthy Association. In today's liturgy, the Church invites us to read in the book of Sirach (cf. 17: 1-13) the great gifts that the Lord has given to men. After having created them, "he filled them with knowledge and intelligence and showed them both good and evil" (v. 7), and "set before them knowledge and gave them the law of life" (v. 11). Science, as I have already recalled, "is a powerful means to better understand both the nature around us and human health. Our knowledge progresses and with it the most refined means and technologies are increased, allowing not only to look at the most intimate structure of living organisms, including humans, but even to act on them in such a profound and precise way that even the modification of our own DNA "(Address to the IV International Conference promoted by the Pontifical Council for Culture on regenerative medicine, 28 April 2018). 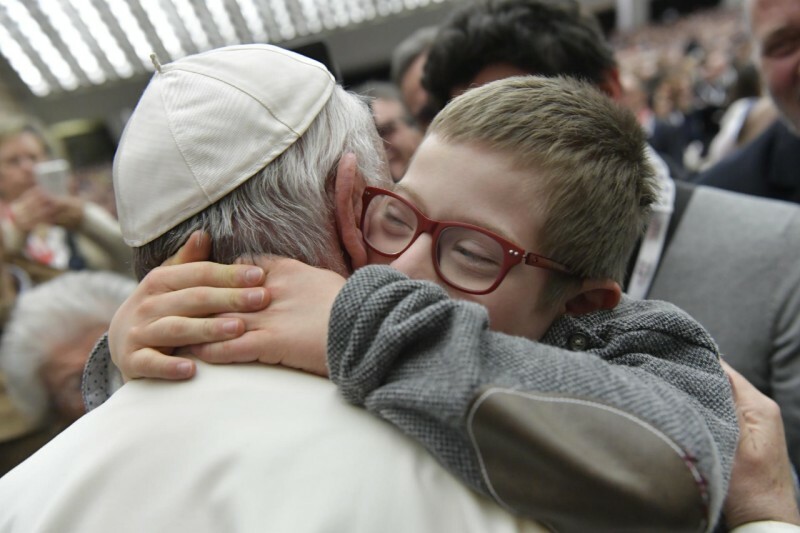 The Church praises and encourages every effort of research and application aimed at the care of the suffering persons. Therefore, I am pleased to express my appreciation for what your Association has done in these decades. Through its precious activity, it has become an important presence on the national territory, placing itself at the service of the sick and collaborating with the various specialized centers. Your main lines of action are very effective in scientific research, health care and staff training. In particular, in these three areas you fulfill the roles to which the man himself is called. With scientific research, investigate the biological dimension of man, to be able to alleviate the disease, with actions aimed at prevention and with increasingly effective therapies. With health care you are close to the suffering, to accompany them in time of suffering, because no one ever feels alone or has the feeling of being now a 'gap' with respect to the social context. Finally, with the care and training of qualified personnel, your action to promote the overall care of the sick person, so that the therapeutic alliance necessary for the patient and the health workers themselves, called to live every day involved in the experience of suffering. In these tasks you are accompanied by the extraordinary testimony of generous voluntary service, of many men and women who offer their time to stay close to the sick. I would like to tell you something. One of the things that touched me most when, six years ago, I arrived in Rome, is the Italian voluntary service. That is great! You have three great things, which imply an organization among you: volunteering - which is very important -, cooperativism, which is another capacity that you have, of making cooperatives to go ahead, and the speakers in the parishes. Three great things. Thanks for this. Like Mary, left at the foot of the Cross of Jesus, the volunteers also "stand at the bed of the suffering and realize that accompaniment that brings so much consolation: it is the presence of tenderness and comfort, which fulfills that commandment to love. reciprocal and fraternal that Jesus has given us (cf. Mk 12:31). This attitude of considerate proximity is all the more necessary in relation to the haematological patient, whose situation is complex due to the very perception of the disease, in its specificity. Proximity, proximity, like Mary at the foot of the Cross. And there are many stories, many stories of cross among you. I would just like to mention one: let me remember here today - one of many - Marilena and Silvano Bellato, as an example. They suffered a double "blow" from life with the death of their sons Fabio and Sara. They had the courage to stand with suffering, like Mary at the foot of the Cross. And from that pain they managed to move forward thinking about the "resurrection" of many children with the foundation of the Provincial Section [AIL]. Thank you so much to them and to many who are like them. Thank you. Sometimes the prolonged stay in isolation departments turns out to be really heavy to bear; the person feels on his own flesh the impression of feeling separated from the world, from relationships, from everyday life. The same trend of the disease and the therapies forces her to question her own future. I want to assure to all the sick people who live this experience that they are not alone: ​​the Lord, who has experienced the hard experience of pain and the cross, is there beside them. The presence of many people who share these difficult moments with them is a tangible sign of the presence and consolation of Jesus and his mother, the Virgin Mary, Mother of all the sick. I am thinking, in particular, of those who express the sharing of the Church with those who suffer from these pathologies: the chaplains, the deacons, the extraordinary ministers of communion. Through their spiritual and fraternal witness, it is the whole community of believers who assists and consoles, becoming a healing community that makes Jesus' desire concrete so that all may be one flesh, one person, starting from the weakest and most vulnerable. The role of doctors, nurses, biologists, laboratory technicians is increasingly crucial, not only in terms of professionalism and scientific training, but also in the spiritual field, where they are called to care for people in their totality of body and spirit. The cure is not of the disease, of an organ or of cells; the care is of the people, in their totality. The person in his spirituality does not exhaust himself in the corporeity; but the fact that the spirit transcends the body causes it to be included in a greater vitality and dignity, which is not proper to biology, but that proper to the person and the spirit. Dear brothers and sisters, your history, your work lavished in these 50 years, the results achieved by research and scientific progress are a stimulus for a renewed impetus aimed at healing and improving the lives of sick people. Your commendable commitment can make every person more aware of the culture of giving and caring for the other, essential food for the life of every human community. I invoke the assistance of the Holy Spirit on your work and, as I ask you to pray for me, I cordially impart my Apostolic Blessing to you.